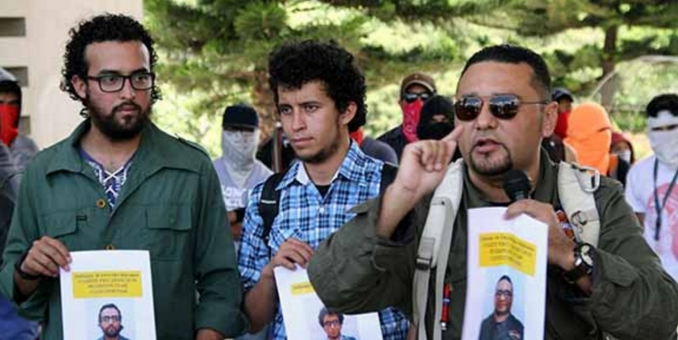 Honduran authorities should drop all charges against PEN Honduras member Cesario Alejandro Félix Padilla Figueroa (picture above left), PEN International said today. Padilla is facing immediate detention after a warrant was issued for his arrest and that of five other students at the National Autonomous University of Honduras (UNAH) in the capital Tegucigalpa, on June 7, 2016. All six have been charged with ‘usurpation’ of university property after allegedly taking part in student protests. The crime carries a prison term of three to five years under Article 231 of the Honduran Penal Code. PEN International calls on Honduran authorities to stop criminalizing social protest and using the justice system to generate fear, censorship and silence among journalists, writers and other in Honduras. Padilla – a journalism graduate and board member of PEN Honduras – and some of the other students have reportedly also been subjected to surveillance, harassment and intimidation by criminal investigators in recent months. He and others have suffered reprisals since 2014 in connection to their participations in ongoing student demonstrations against the privatisation of the UNAH and calling for greater access to state education and student participation in governance of the university. On 7 June 2016, the Public Prosecutor’s Office accused Padilla, Moisés David Cáceres, Sergio Luis Ulloa, Josué Armando Velásquez, Dayanara Elizabeth Castillo and Izhar Asael Alonzo Matamoros of occupying UNAH buildings for 48 hours and acts of vandalism against university property during a fresh outbreak of protests that began in early June. However, Padilla was reportedlythe only one of the six accused who was actually present in the UNAH at the time of the occupation and did not take part in the occupation but was there to observe the policing of the protest in his capacity as a journalist and human rights defender. This is not the first time that Padilla has been the target of harassment and intimidation by authorities. In 2015, following his participation in student protests, Padilla was subject of unlawful surveillance by agents from the Technical Agency for Criminal Investigation (ATIC). PEN International believes that Padilla and the other students charged with ‘usurpation’ on June 7, 2016 are being prosecuted for the exercise of their right to freedom of expression, assembly and association by peacefully participating in and observing student protests. It calls on the Honduran authorities not to criminalize social protest and to drop the charges against Padilla and his fellow students.